Main objectives planning and designing road network to provide optimized connectivity to rural and urban areas. To achieve goal of socio-economic development through proper management of road communication. construction, upgradation and maintenance of roads and bridges. We undertake complete range of construction activities with support of approved Contractors. Our Construction Team supervises & manages the site work and ensures that all necessary quality and safety measures are incorporated during the construction process. SIL also provide stand-alone Construction Management Services on case to case basis. We are the service provider of Road Construction Services. we provide road constuction services with labour and machinery. Oder should be 100 ton, we supply asphalt bituminios mix as per specification. 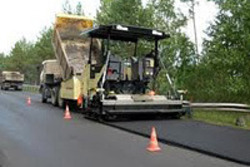 Through regular improvement, we are offering an exclusive collection of Asphalt Road Construction Service. The chippings are rolled into the asphalt "mat" with a smooth wheeled roller without vibration to ensure a smooth ride quality of the road surface. We are a service provider of Road ConstructionServices at Jamshedpur under JUSCO. We are looking for queries majorly from West Bengal, Bihar, Orissa, Chattisgarh and Assam.